It all comes down to Personality! It all starts with a straw wreath frame and some floral “u” pins. Wreaths are so easy to make! In my book, it is essential to have a straw wreath frame, floral “u” pins, and some Spanish moss. Anything goes for the rest! My hydrangea didn’t flourish this year, due to the drought this summer I presume. So I did get some lovely deep cherry colored blooms from a friend. I traded her zucchini bread for hydrangea blooms, that’s fair isn’t it? These green colored blooms are hydrangea Incrediball. I have all of my colors on the table, or hanging on my Flower Tree, and I just dive in. The hydrangea paniculata ‘Vanille Fraise’ had very small, beautiful blooms this year, but their stems weren’t very strong and most of them broke while pinning them. That was a bummer, as they were really pretty! Piece by piece the wreath comes together. I made this one night after work this week. I felt the need to create something! Since I don’t have anything on my crochet hooks, it had to be with dried flowers. I still have loads of lavender around my house, too! (See what I did with that further down the post.) I really enjoy working with my hands, and I’m glad to have such beautiful materials around me to create with. Ta-dah! This is where my wreath will reside in our kitchen. Purple, cherry, green, blue, pink: it’s all in there. Inside lighting doesn’t give the exact coloring. Nothing beats natural lighting, but then of course there is morning sunshine and evening sunlight, both of which slightly change the coloring again! You can see for yourself in the following photos. Bright daylight, but no direct sunlight: This coloring is probably the closest to reality! This picture has the tiny pink hydrangea paniculata Vanille Fraise. The dried hyrdrangea is mostly hardy to work with. The green stems are actually doubled-up stems that I have smushed together after taking off brown markings on them. You can really do anything with them (as long as their stems are strong!). Like I mentioned, I still have loads of lavender “drying” around the house (that I really need to put away!). I decided to create a simple arrangement, using a magenta colored vase which happens to perfectly match some of my dried roses. Yes, these little things just get me all excited! First of all, I was able to use a lot of lavender to fill this vase, and secondly, that magenta color is *gorgeous*! Home sweet home for my vase of lavender + roses. Our playhouse in the morning sunlight. Hello Wordless Wednesday friends! A quick little post (with very few words) about using plant material to help keep flowers in place when arranging them. Materials: strong plant stems, rubber bands, scissors, some patience. The “guard” sits right on top of the vase and helps to keep the tall stems upright. I love the evening sunlight coming into our front hallway. My Father-in-law started these from seeds he’d collected from my plants last year. Phew, did you get that? He gave them to me in cute little pots that were supposed to be planted right away… Eventually we got to planting them in the ground! So my plants are very late. I’ve been cutting them now in the hopes of bringing on more flowers. We’ll see! 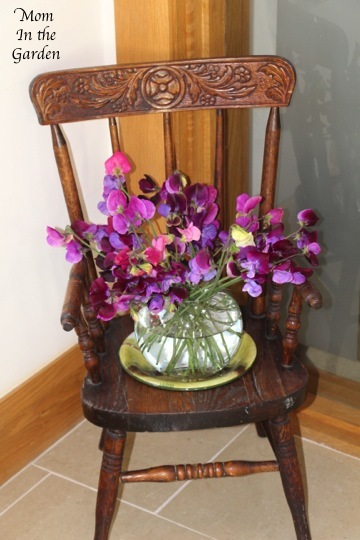 My vase of Sweet Peas was even more full last week! I loved how they kind of flopped all around in the vase, so I used the same vase this week. Last week I had the vase in our back room. The scent really does fill the room! What’s growing in your garden this week that you can throw into a vase? I’d love to see it! Just recently I found myself looking through my past blog posts. My husband and I had a discussion and he felt I’d strayed away from my original ‘blogging about the garden’ plan since this past year I mainly posted on Mondays for the meme ‘In a Vase on Monday’. I saw his point in that I certainly need to blog more about what is going on in the garden. But I loved looking through what flowers I was able to create arrangements with during the different months. close-up of that pretty blue! Our pewter water goblet. Can you see the picture of the ‘stamping of the grapes’? This week my delphinium ‘cobalt dreams’ had one stem that was broken. I bought three of these plants just this past month and they are doing so well. They are quite showy! I think the blue and white are lovely. So I was happy enough to use the broken stem. The dusty miller Lychnis Coronaria is just going crazy in my garden this year! It has taken over half its bed. All of this is from one small plant two years ago! I will have to move some (a lot?) of it to another location where it an spread without getting in the way of other plants. The above picture shows my blue delphiniums and my not yet blooming shasta daisies (to the right of the delphiniums)! That was taken late last week and they only started to bloom yesterday! They were divided early this spring, so they’ll be in two places along the ditch-wall garden. A rather simple arrangement, with an almost red, white & blue hue! Maybe you’ll join the meme? Or at least visit to have a look-see at what others have created? I hope you will. Peony are such lovely flowers. It is a shame how short their lives are! I have to be sure to pause and take a moment to really enjoy them because all too soon they will be gone. My plants have finally established themselves enough for me to cut a bouquet to enjoy in the house. I had a couple of monkshood stems left from a bouquet I had made last week (which I never posted about!). I like the purple and red together, although the two stems seem to me like antenna. This is the first year that I have been able to fully see that hosta on the left. Normally the slugs eat it completely! I rather like it. The vase is among the plants due to the high winds we’ve been experiencing! I do really hope that warm weather comes soon. I am linking up with Cathy at Rambling in the garden https://ramblinginthegarden.wordpress.com/2015/06/01/in-a-vase-on-monday-pink-and-proud-of-it/ for her “In a vase on Monday” meme. Won’t you visit and join us? Happy start of summer! May the warm weather find us soon! Given that I had a vase of flowers from the garden, I could hardly let my Monday go by without contributing to Cathy’s meme “In a Vase on Monday”! Thank you Cathy, of Rambling in the garden https://ramblinginthegarden.wordpress.com/2015/05/04/in-a-vase-on-monday-in-your-own-hands/ , for hosting such a fun meme! Pop on over to Cathy’s blog to see some great ideas for creating arrangements from what is in the garden now from gardens all around the world! These parrot tulips are new flowers for me. We planted them last fall, and they have provided a lovely pop of colour in the garden. They are rather unusual, or shall I say “sloppy”? Yes, I’m sorry, I think they are rather sloppy the way they open up and seem to almost hang with their arms wide open! I still like them, I just find them rather … odd? Lovely colours, even if a bit tattered looking! I’m loving that I had enough tulips to cut for a vase. I *still* struggle with cutting flowers from the garden! It’s not so bad if they are nearly gone though. In all of Ireland, it feels like the flowers in our yard are the very last to bloom! I still have plenty of daffodils that haven’t even thought about blooming yet. But for today’s post of “In a Vase on Monday” I do have enough daffodils for a lovely bouquet of several different varieties (small prayer answered!). Not quite opened … A rather triangle of a shape, don’t you think? We’ve lived in our house for almost five years, and it has taken me all of that time to plant enough daffodils to be able to have a substantial bouquet! I was a bit finicky about where to plant them, what kind to plant, and how many to plant. I should have just gone with “everywhere, all kinds, and lots of ’em”! I’m happy with the few different varieties that I have now. The Ice King is by far my favourite. I caught the very tail end of the sun on the day that I cut the flowers. I hadn’t paid close enough attention to the weather (read: I was deep cleaning the house because Easter is nearly here and God forbid anyone saw the state of what our house usually looks like!). So I desperately tried to find rays of sunshine through the window the following day. Unfortunately not only was the sun in short supply, the wind was too strong to photograph flowers in. But alas, eventually I found an opportunity to give it a lash. I kept the flowers low to the ground in a protected spot. The last thing I wanted was to have my vase fall over and break! The sun sure does make a difference! See that poor little ugly duckling candle? That is my only Easter decoration out so far! I came across him while I was cleaning … which prompted me to ask my son to bring the boxes of our actual decorations out of the attic for me. He was kind enough to oblige me. Now I just need to get my act together and get those lovely spring items out (and quick!). But for now we just have our cheerful daffodils (and the ugly duckling candle). Have you grown any different varieties of daffodils that you especially like? Please do share! I hope you’ve enjoyed my “In a Vase on Monday” post. You will find other lovely arrangements linked to Cathy’s Rambling in the Garden blog https://ramblinginthegarden.wordpress.com/2015/03/30/in-a-vase-on-monday-bluenwhite/ as she hosts this fun meme to see what everyone has in their gardens all throughout the year. Maybe you’d like to join in? Please do!